Almost everywhere these days, cases of infidelity are being reported. In such circumstances people on both personal and professional level choose to be cautious. Be it the matter of a pre-matrimonial investigation or hiring a new employee at office, a run through on the person’s background is considered important. Therefore, FIDA INDIA offers you the service of background verification with its highly experienced and skilled team of detectives and investigators. The Corporate and business investigation that is divided into pre and post-employment counts for the criminal records, bankruptcy, references, credit checks, medical records, drug testing etc. The background check which is the most basic part of the investigation is not only for the educational qualification, but the overall personality and habit check of a person. To be aware of the lifestyle of a person, so that it will not affect you and your organization’s performance, later on in any wrong manner. All of the background verification investigations carried out by FIDA detectives is done in absolute secrecy maintaining the anonymity of our clients. We offer our clients the freedom of being anonymous if they wish to, as we understand the gravity of the situations and relation with the subject on investigation. The latest comprehensive tracking software, analytical system, vehicle GPS tracking tool, advanced tools for the sting operations with other latest technological software assist our team in their investigation and bring out the clear truthful results backed up with valid documents and audio/visual proofs. 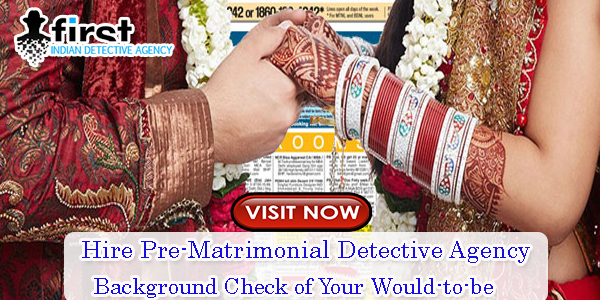 In few cases of background verification of a candidate in personal investigation, we collect several information for the client such as Past relations with other men / women; break ups and divorce cases if any, Job profile, work reputation and business profile, Complete Earning & Income details, Family background and Reputation, Personal Habit, behavior & nature, Verification of current financial status, Drug abuse details including alcohol consumption and smoking etc., Verification of the lifestyle and social status. In the cases of corporate and business investigations of the background of a candidate, we provide information about the truthfulness of the resume, past jobs, connections with past company, and behavioral patterns on the last job. Performance evaluation by the past employers is also arranged by FIDA detectives if the client has demanded. FIDA INDIA has a large network of connections for making such documents easily accessible and available while investigating. Hire the skilled and experienced detectives and private investigators for any kind of background verification of the candidates.